Thursday, April 30, will mark the 40th anniversary of the Fall of Saigon, which effectively ended the Vietnam War. That day, North Vietnam took control of all of South Vietnam, and immediately declared a united Vietnam. 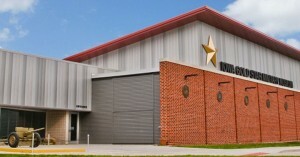 That day, the Iowa Gold Star Museum, located at 7105 NW 70th Ave. in Johnston, will host a ribbon cutting ceremony dedicating its new Vietnam War exhibit, beginning at 10 a.m. The public is invited to attend this event. The exhibit, which was made possible by a grant from the Gabus Family Foundation and other private donations, features an UH-1H “Huey” helicopter display, a M274 “Mule” ½-ton utility truck and other artifacts. A scrollable list of Iowans who were killed in the Vietnam War is available, as are television monitors featuring stories from the Vietnam War, our nation’s first televised armed conflict. A full-scale diorama and mural, painted by local artist John Neal, depicts the tunnel system that laced the hills of Vietnam. The jungle diorama includes figures of a U.S. Army Soldier and North Vietnamese Army Soldier concealed in a bamboo grove. The nine years of American involvement in the Vietnam War cost the nation the lives of 55,000 Americans, as well as 300,000 wounded. Nearly 900 Iowans were killed in the conflict. Five Iowa service members were awarded the Medal of Honor, our nation’s highest military award for heroism, during the war.